Published on June 26, 2017 in Lakes Region and New Hampshire Resort. Closed Tags: Fireworks, New Hampshire Resort, NH Resort. A 30+ year tradition in the making, nothing quite says “I love America” like Cotton Candy, BBQ and Fireworks. So grab your family and friends and head to Steele Hill Resorts to celebrate Independence. 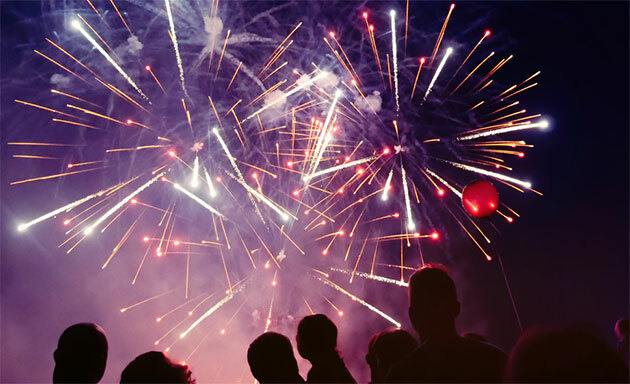 This year’s festivities will be hosted on July 3rd and feature fireworks, a BBQ, and live music starting at 3pm. For any newcomers to the party, the fireworks display at Steele Hill offers a very unique vantage point. Guests are invited to sit on the lawn facing the view near the resort outdoor patio while an impressive fireworks display is shot off further down the slope of the golf course. The show will end up being at about eye level so no need to go home feeling like you just got stuck sitting in the front row nose bleed section of the movie theater. These fireworks are up close and personal. The other unique feature of our celebration is that since we have such a great view you can actually see other towns fireworks going off across the Lakes Region. Really get into the spirit of independence as the horizon lights up with celebratory explosions. Pre-Fireworks, join us for hot dogs and burgers under the outdoor tent, if you are 21 years or older, beer will also be served. For the kids, we will be selling glow sticks and sparklers, along with fried dough and cotton candy. It wouldn’t be a celebration without music, so on the Hilltop Restaurant deck DJ Mike will be rocking the tunes and the Sweet Bloods will be performing live music under the outdoor event tent. Don’t forget to bring something to sit on and a sweatshirt in case of a cool summer breeze. The Atlas firework show will begin to shoot off between 9:15 and 9:30pm. With some of the best views in New Hampshire’s Lakes Region, you aren’t going to want to miss this spectacular event. We’ll see you there! Published on October 10, 2012 in Lakes Region. 0 Comments Tags: Lakes Region Foliage, New Hampshire Foliage, NH Foliage. Picture yourself looking down on a world of magnificent color and breathtaking natural beauty. New Hampshire’s Lakes Region offers some of the most amazing displays of foliage in all of New England. The region’s magical combination of near perfect temperature fluctuations and forests fed on pristine lake waters makes foliage season a special time of year. The numerous sweeping mountains and hills that frame in the lakes literally come alive with one final display of color. It may sound all too exaggerated, but in truth words can do little justice to describe this brief yet piercing season. Locals relish these precious weeks of prime foliage that remind them why they choose to live in the area. For the select visitors that make the pilgrimage up to the lakes, the trip is most definitely worth the payoff. For guests at Steele Hill Resorts, the panoramic views looking across Lake Winnisquam to the burning reds and bright yellows of the forest canopy beyond are second to none. Visitors can choose to take in the scenery from one of the many decks or head out to explore the fall festivities in the Lakes Region. 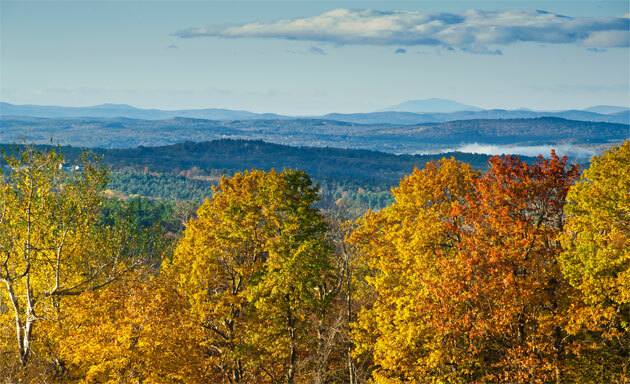 From the joys of traversing your first corn maze to the memories created visiting a local apple orchard, Steele Hill offers a conveniently located hilltop perch above the New Hampshire foliage. So if you are in the mood for an idyllic fall retreat, grab your camera and pack your sweaters for a getaway to the Lakes Region. The foliage and festivities are sure to create a memorable experience. Published on August 8, 2012 in Lakes Region and New Hampshire Resort. 0 Comments Tags: Lakes Region, New Hampshire Resort. Formed over thousands of years by glacial erosion, New Hampshire’s Lakes Region offers unparalleled beauty and natural splendor. Majestic bodies of pristine water including Lake Winnisquam, Squam Lake and the famous Lake Winnipesaukee serve as the focal point of the region. Framed in by the Belknap Mountain Range along the shores of Winnipesaukee and the White Mountains to the north, the diverse landscape offers a unique display of New Hampshire’s world famous scenery for all to enjoy. The area has a long tradition of tourism with visitors looking to explore the sites and enjoy the attractions. 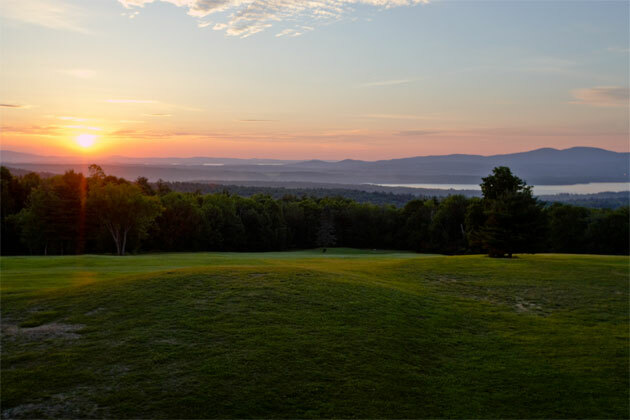 From the golden age of summer camps nestled along the shores to the pioneer days of downhill skiing at nearby Gunstock, Waterville, Loon and Cannon Mountain, the Lakes Region is the perfect destination to escape from the city and embrace the spirit of New England. Experiencing a surge of popularity with the Boston elite in the 20’s, 30’s and 40’s as a wilderness retreat, the area has continue to grow and cater to new visitors each year. 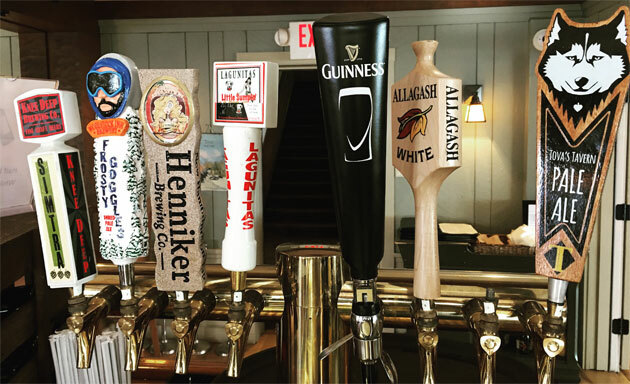 From the quiet Mountains and Hills perched above Lake Winnisquam to the bustling Boardwalk of Weirs Beach, New Hampshire’s Lakes Region truly has something for everyone. The summer season offers a variety of exciting activities. Adventure seeker can experience dramatic panoramic views from local summits like Mount Major, Red Hill and Mount Morgan. For those looking to see the lakes firsthand, local marinas offer boat rentals and the famous M/S Mount Washington cruises Lake Winnipesaukee each day with a cargo of tourists. More family fun can be enjoyed basking at the public beaches, racing at an area go-kart track, putting your way through a mini-golf course or trying your hand at one of the classic arcades games at Funspot. Fall in the Lakes Region hosts one of the most beautiful displays of foliage in the entire country. The mountains burst into glowing oranges, bright yellows and burning reds and the lakes reflect the scenery along their shores. One need only rent a room with a deck to appreciate the splendor. Visitors can enjoy apple picking and hot cider at the local farms or go to one of the many country fairs for some true New Hampshire fun. The winter season marks an opening to the many ski mountains in the area. Gunstock Mountain, with some of the most notable views of Lake Winnipesaukee, comes to life with carpets of white snow and smiling families. Enjoy a day hitting the slopes and experience a true apres ski atmosphere back at your resort in a relaxing hot tub or by a glowing fire in the tavern. For those non-skiers out there, quiet sweeping snowshoe trails through the hills offer a Zen alternative to any downhill sports. Spring in the lakes region marks a rebirth of the lush greenery. Visitors can experience great deals on lodging with the advantage of fewer crowds at the many area attractions. The Tanger Outlet Mall offers a perfect daytime destination with unbelievable deals only a short distance from the highway. For long time visitors the charms of the Lakes Region are easy to spot. Many have their own favorite activities and attractions that draw them back each year. If you have yet to experience the area for yourself, you are in for a pleasant surprise. You just might find your own piece of heaven looking down on the lakes that stretch to the horizon. Come plan a trip, and check out one of our Lakes Region Vacation Packages. We hope to see you soon.